I’m out of town and can’t run. I’m a little bummed about that. Tuesday was my last run and it my running keeps getting better (finally). I am sticking to my 5 mile route for now and the mountain on the weekend. Tuesday, I went out slow at first. As I got going, I started feeling better and stronger. My legs felt strong. My hip felt good overall. It always seems to bug me a little more at the end of my runs, but not much. So at an 8:19 overall pace, this was the best 5 miles I’ve run in my neighborhood in a long time. So, is it the mountain running or the ACV (apple cider vinegar)? Yes, I am still doing both. 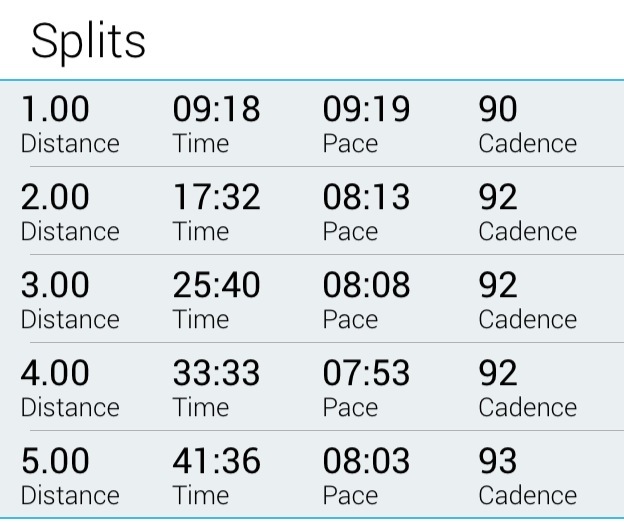 Either way, I am getting good results and am excited about my race at the Country Music Half Marathon in April. I do need to work on my long runs though. I still stop at 8 miles after going up the mountain and back. I would like to add more miles to that soon. That should wear my legs out well. Anyway, no running yesterday, but I hope to get home before dark so I can run today. I hope you all are happy and running. I also hope to get back reading blogs soon. This entry was posted in Day off, Half marathon, Running and tagged acv, Apple cider vinegar, Country Music Half Marathon, Mountain Run, running. Bookmark the permalink. ← 2 years running today! Your cadence looks good. Is that what it’s always been? 90 is a really good cadence! Thanks! That was one thing I really worked hard at when I first started running. Hope you got to run. Glad your hip is good. Thanks. Sadly I got home in time, but I had two cars in two different shops for problems and spent hours waiting to pick them up. So no running again yesterday. I can really tell an attitude shift when I can’t run. Today it is going to rain all day, but Lord willing, I’ll be out there anyway.